The solution is simple to open and start Microsoft Internet Explorer always on Windows 8.1 or Windows-10 desktop and disable Metro IE App! Start the MS Explorer in the Windows 8.1 desktop mode! In the Windows 8.1 MS-IE Internet Options select the Programs tab (... see Image-1 Arrow-4) . Now you can always launch Internet Explorer on the Windows 8.1 desktop (... see Image-1 Arrow-5) without Metro :-)! ... switch tabs in the Win 8/8.1 Internet Explorer start (metro) screen app! ... uninstall the Internet Explorer in Windows-8 and 8.1! ... use MS-IE 10 or 11 as the default browser in Win 8 and 8.1! (Image-1) Always run and start the Internet Explorer in Windows 8.1 desktop mode! Start how to open internet? Windows 8,1 internet explorer metro app? Launch Internet Explorer Windows 8.1? Internet explorer windows 8.1 open in desktop? Windows 8.1 internet explorer open on desktop? Always open applications in desktop mode windows 8.1? Windows 8.1 disable ie metro? Windows 8.1 internet explorer app vs desktop? Windows 8.1 internet explorer opens internet explorer desktop instead of app? Windows 8.1 open ie 11 on the desktop? How to open program Ã®n win 8.1 desktop mode? Open internet explorer windows 8 desktop? Disable internet explorer app windows 8.1? Always strt with desktop view? Windows 8.1 turn off metro internet explorer? Windows 8.1 internet explorer apps opens as desktop? Windows 8.1 internet explorer desktop mode always? Auto start windows 8 metro internet explorer? Open internet explorer desktop windows 8.1? Start ie always desktop mode windows 8.1? Always start windows 8 in desktop mode? Disable windows 8.1 metro mode? Internet explorer windows 8.1 not opening in start? Disable windows 8.1 Internet explorer metro app? Internet explorer always starting desktop windows 8.1? Windows 8 disable ie app? 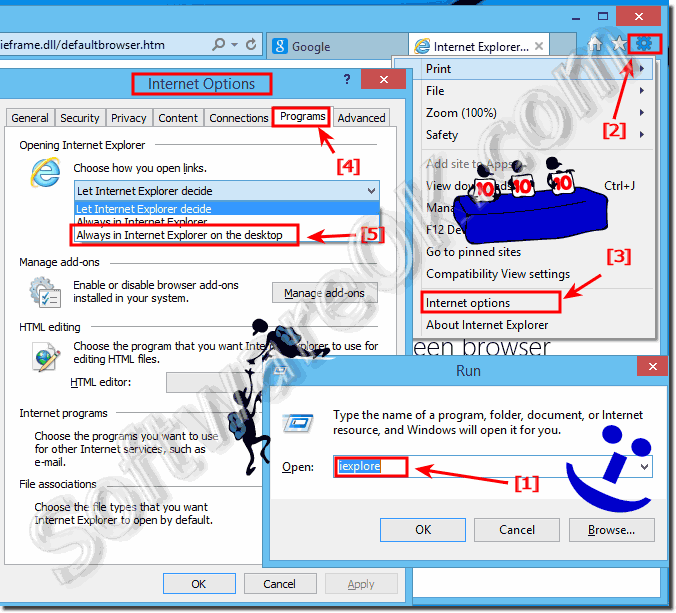 How to open internet explorer in windows 8.1? Windows 8.1 IE app disable? Windows 8.1 internet explorer is starting at logon? Windows 8.1 internet exploreralways run on desktop? Internet explorer app not same in internet explorer desktop? Internet explorer 8 always run desktop mode? How to start desktop Internet Explorer on Windows 8.1? Windows 8 autostart internet explorer? IE 11 opening and closing in Windows 8.1 desktop? Windows 8.1 internet explorer app is opening up to desktop? Run internet explorer 11 in metro mode? Using internet explorer from windows desktop or windows start? Windows 8 stop Internet Explorer app running? 8.1 metro ie always loads desktop? Desktop opens when internet exlorer 11 opens? Open internet explorer in windows 8.1? Stop browser from launching at login windows 8? Windows 8.1 metro opens desktop explorer? Internet explorer disable metro mode? How to open desktop ie in windows 8.1? Windows 8.1 run internet on desktop? Internet explorer always starts in desktop mode? Windows 8.1 start internet explorer desktop? My internet always opens on the desktop not on start menue windows 8.1? Turn off windows 8 metro apps fron internet? Windows 8.1 cant open programs in desktop mode? Internet explorer app windows 8.1? Windows 8.1 disable ie app mode? Wibdows 8.1 explorer desktop vs metro? Open to Start vs. Desktop? Windows 8.1 remove internet explorer metro? Disable windows 8.1 internet explorer metro? Windows 8.1 internet explorer do not open as metro app? Set explorer to always start as desktop app? Disable metro apps windows 8.1? Always desktop mode windows 8.1? How to open windows 8.1 in desktop mode always? Can windows 8.1 always open in desktop mode? Windows 8.1 open explorer in metro? How to stop internet explorer from opening as an app windows 8.1? Internet explorer app alternative windows 8.1? Windows 8 disable auto IE open? Stop internet explorer starting automatically windows 8.1? Windows 8.1 prevent internet explorer? Run ie on desktop à¹„à¸¡à¹ˆà¹„à¸”à¹‰? Start IE11 in Metro Mode windows 8.1? Windows 8.1 disable metro ie? Windows 8 internet explorer start? Stop win8 auto open explorer? Always run internet explorer in desktop mode? How to open internet explorer from desktop 8.1? Internet Explorer for Windows 8? Change desktop e ie windows 8.1 app to desktop? Internet explorer open with windows 8.1 retro? Windows 8.1 stop internet explorer metro? Always use internet explorer not app? Windows 8 internet explorer always desktop? Disable internet explorer 11 metro app? RUN INTERNET EXPLORER IN DESKTOP windows 8.1? Windows 8 internet explorer always opening in metro? Internet explorer not strting windows 8.1? Windows 8.1 internet opening on desktop? Windows 8.1 internet explorer desktop mode? Auto start internet explorer in desktop? Default browser in windows 8.1 startup? Iexplore app mode file location? Disable surface 2 internet exploer app and use desktop version? Windows 8.1 stop opening apps to desktop? Ie desktop on start screen windows 8.1? How to make metro open when startin with windows8.1? Disable ie app windows 8.1? IE11 desktop icon always open IE in desktop mode? How to prevent internet explorer from opening in windows 8 mode? Windows 8.1 internet explorer always open desktop? How to always run explorer from desktop? Explorer launches form desktop, not start apge in windows 8? How to stop explorer auto opening windows 8? Winows 8.1 ie 11 tile mode very slow? Windows 8.1 internet explorer autolaunch? Internet explorer start automatically in Windows 8? Explorer windows 8.1 open as desktop? Windows 8.1 open internet explorer in desktop? Internet explorer not open as windows 8.1 app? Open internet explorer in windows 8? I can't open internet explorer fom desktop in windows 8.1? Disable internet explorer app windows 8? How to disable metro ie in windows 8.1? Explorer 11 always opens in the desktop mode? How to open internet explorer in 8.1? Internet explorer stops when run from windows 8 desktop? Start internet explorer in desktop windows 8.1? Disable startup tab in internet explorer 8.1? How to change file download location internet explorer 11 windows app? Windows 8.1 ie disable ie app?